An iPhone application that takes electrocardiogram (ECG) readings that is vital to diagnosing for atrial fibrillation was presented at the American Heart Association Scientific Sessions 2012. Atrial Fibrillation (AF) is a type of arrhythmia (irregular beating of the heart) where the patient suffers from a rapid beating of the heart combined with poor blood flow. This leads to an increased risk of suffering from a stroke up to as much as seven times the average. Fifteen to twenty percent of people who have strokes have atrial fibrillation. And an estimated 2.7 million Americans are living with this condition. AF can be detected through the monitoring of the pulse either manually or by an electrocardiogram (ECG) reading. ECG is a reading of the heart's electrical activity over a period of time. This is done through electrodes attached to the outer skin. At the American Heart Association Scientific Sessions 2012, AliveCor presented a study demonstrating a clinical-quality, low-cost mobile ECG heart monitor application that uses an iPhone 4 or 4S to record ECG readings. This allows patients to monitor their heart rate anywhere and anytime. It also provides physicians with an additional heart health assessment tool. The study, Validation of an iPhone ECG Application Suitable for Community Screening for Silent Atrial Fibrillation: A Novel way to Prevent Stroke, was presented by Jerrett Lau, M.B.B.S.of Concord Hospital in Sydney, Australia. The iPhone application, AliveCor iPhone ECG, records a high quality tracing of the electrical activity of the heart which could allow doctors to quickly and accurately diagnose atrial fibrillation. Researchers performed traditional electrocardiograms (ECGs) and tested the iPhone-based ECG application, AliveCor, on 109 patients. Two cardiologists interpreted the uploaded iPhone ECGs. 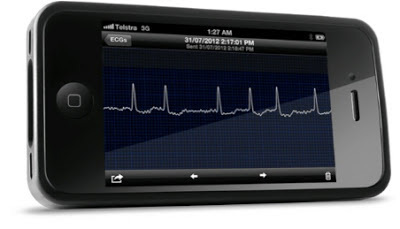 The iPhone ECG was also processed on the server to provide an automated diagnosis. The iPhone application’s diagnostic accuracy was compared to traditional interpretation by a cardiologist with a 12-lead ECG. Based on iPhone ECGs, the cardiologists and automated algorithms correctly diagnosed atrial fibrillation (a quivering or irregular heartbeat) 95 percent of the time, researchers said. iPhone ECG interpretation was able to correctly differentiate atrial fibrillation from normal rhythm in greater than 94 percent of cases. About 1.4 percent of apparently healthy people over age 65 have undiagnosed atrial fibrillation, and most have no symptoms, yet have a high risk of stroke which is preventable. The device could accurately screen for undiagnosed atrial fibrillation — potentially reducing the burden of atrial fibrillation-related complications, especially stroke, researchers said. This article is based on the study presented at the AHA Scientific Sessions 2012. This is not sponsored, solicited nor endorsed by AliveCor. The American Heart Association and Quantum Day does NOT endorse AliveCor, its products or services and strictly prohibits any suggestion of endorsement, recommendation, or superiority of one company, product or service over another company, product, or service. This article is based on the study presented at the AHA Scientific Sessions 2012. As of 06 November 2012, the FDA has not cleared the sale of the iPhone app in the United States.